Reetta Hiltunen's “Reshuffle” is an enlarged playing card set/installation, containing 48-pieces of individual card characters stemming from the traditional Finnish children's card game titled Pekka-game or Happy Families. 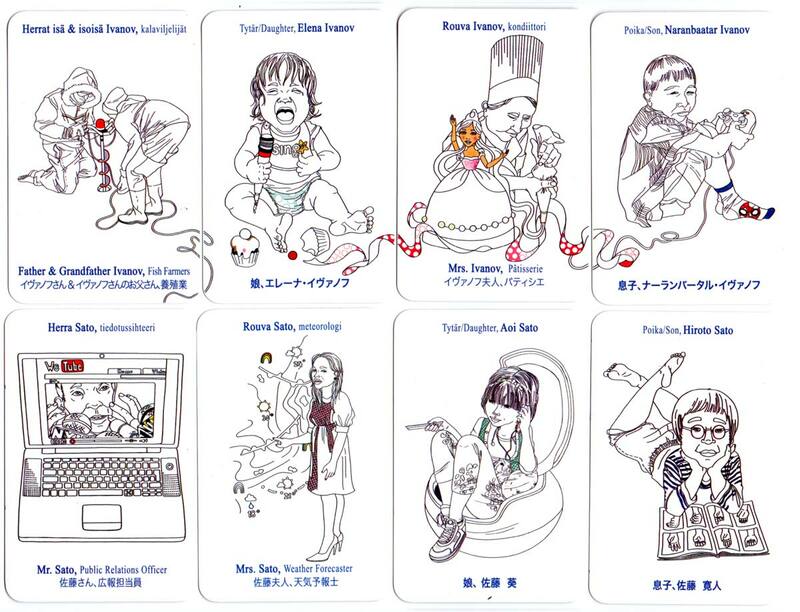 “Reshuffle” consists of transformed, 21st century families with realistic, international features and professions instead of the usual stereotypes. Reshuffle's objective is geared towards promoting, educating and raising cultural awareness... demonstrating an enlightened attitude to all kinds of human difference. Above: photograph of gallery installation showing two over-sized cards. Rather than describing the newly transformed family types the focal point of the game is centred round cultural understanding. 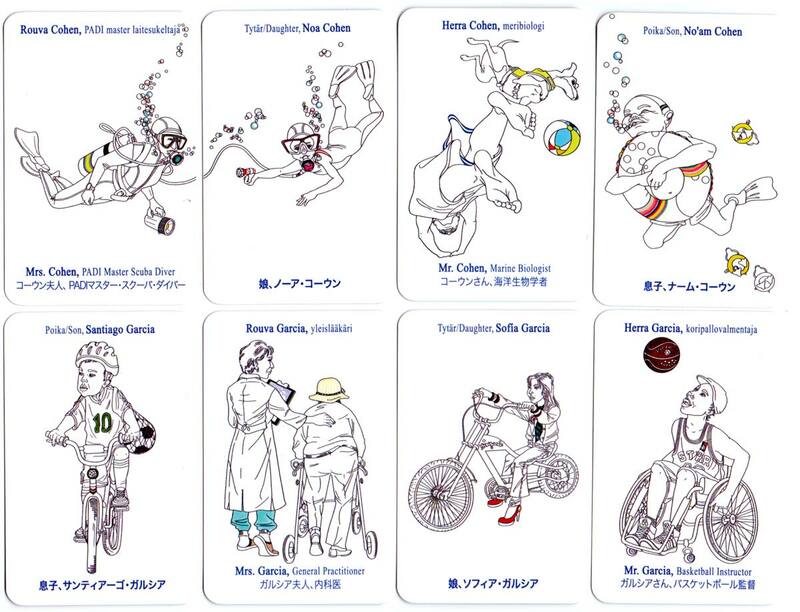 Players collect Mr, Mrs, Son and Daughter card characters from a diversity of blends and origins e.g. England, Ghana, Russia, China, USA, Portugal, Sweden etc. Above: cards from the first digital print edition, 48 cards + 7 extra cards in cardboard tuck-box. The “Reshuffle” project has involved 3 years of ongoing, intensive planning and production. The in depth research work involved finding the most common first- and surnames, improved job-titles and language translations (Finnish, English, Japanese). Researching the work proved fascinating alongside the character drawing and printmaking process. Characters' skin tones are left blank. 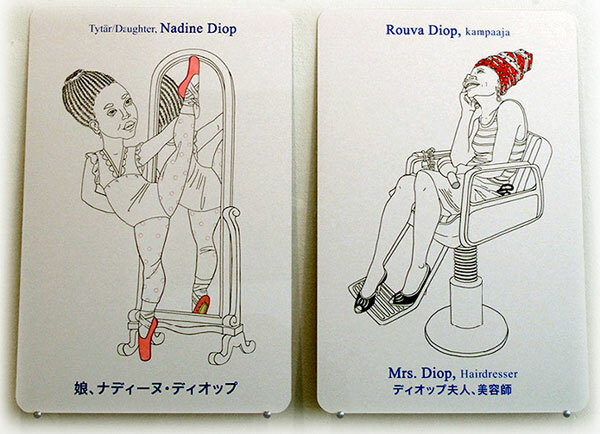 The drawings coupled with given names refer to the person's heritage. The viewer has to visualize the true ethnicity of the card's identities. 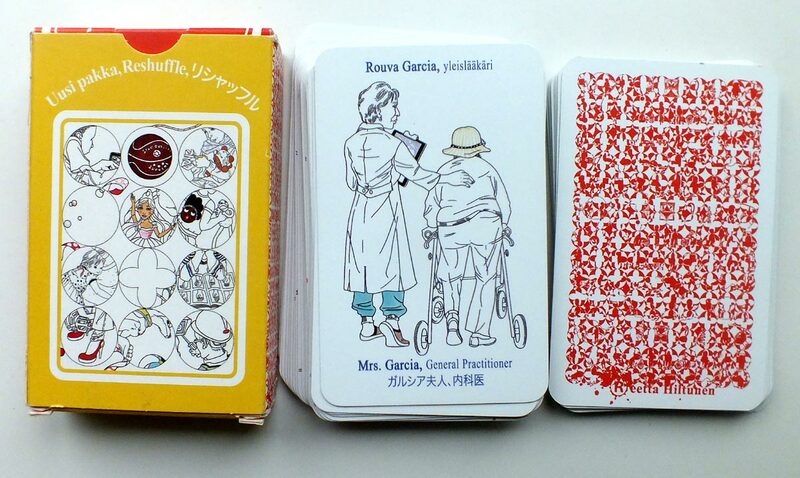 The first edition of the “Reshuffle” project was a unique, handmade card collection on giant cardboard backings and card boxes. The small format pack shown above is a digital print series of the original Reshuffle artwork. Cards and background information © Reetta Hiltunen, 2010.